Spring is in the air. While we hockey fans in the U.S. of A start thinking about “Stanley Cup Playoffs” when the snow starts melting, the rest of the country thinks of another sport: baseball. I am not a big fan of baseball, but here in Chicago we are doubly-blessed with two teams: the Cubs and the White Sox. All the talk on the news lately, about spring training, pitchers, catchers, batters free-agent signings, roster cuts and so forth got me thinking about this baseball card. 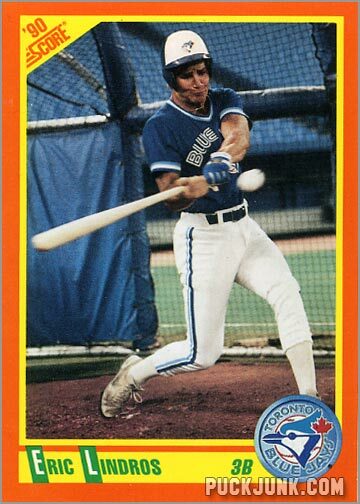 Released in the 1990 Score Baseball Rookie & Traded set, it is a card of Eric Lindros, dressed in a Toronto Blue Jays uniform as he swings at a pitch. Eric is another in a growing list of multi-talented athletes who are cropping up in the sports world with increasing frequency. 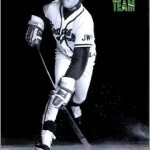 Unlike Bo, Deion and D.J., however, his two sports are hockey and baseball. 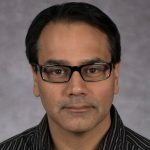 This makes him quite similar to a current major leaguer who excelled in both sports – pitcher Kirk McCaskill of the Angels. McCaskill was chosen in the ’81 NHL entry draft by the Winnipeg Jets, and totaled 22 points in the AHL. In hockey, Eric is a very known quantity; at 17 he is being touted as the next Mario Lemieux. 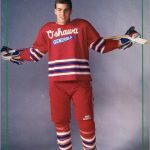 After playing on Canada’s gold-medal team at the ’90 World Junior Championships, he led Oshawa to the OHL regular-season title, playoff championships and Memorial Cup. 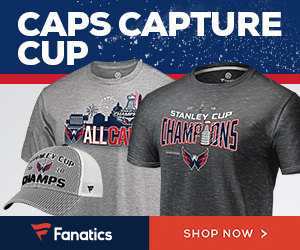 He had 17 goals and 19 assists in 25 regular season games and 18 goals and 18 assists in 17 playoff games. Eric’s dominant size and skill make him a favorite to be the first pick in the 1991 NHL entry draft. 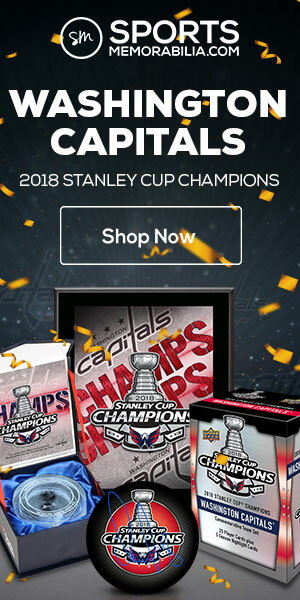 After reading this card, I’m not sure if Score’s intention was to make hockey collectors buy a set of baseball cards, or if it was a way to cross-promote their hockey cards to baseball fans. 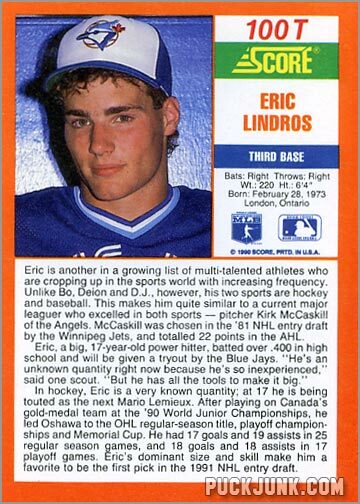 Either way, let the record state that Lindros never played baseball for the Blue Jays – or any Major League Baseball team, despite the fact that the front of the card states that he’s a third baseman – his position on his high school team, perhaps? 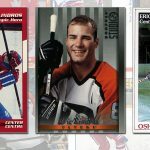 Though I am forced to ask, when did Lindros have time to play high school baseball, between major junior hockey and international competitions? 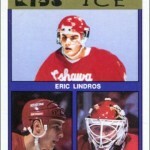 When this card was released, I had a hard time believing the hype machine that was Eric Lindros. Sure, he was going to be in the NHL, and probably good too…but I was hard pressed to believe that he’d be a pro baseball player as well. So, when this card came out, I was not one of the many hockey card collectors who paid $5 for this card (or $10 or so for the complete Rookie & Traded set). If I was going to spend $5-10 back then, it was going to be on hockey cards, damn it, and not baseball. Recently, I picked up this card for a quarter – the magic price of most common cards these days. 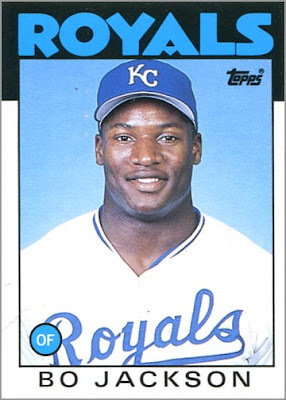 In retrospect, this card is cheesy – and you got to love that strained look on “Big E.’s” face as he takes a swing – but it is still a neat card nonetheless. Now I think of other potential “crossover” photo opportunities. Imagine someone tall, like Mario Lemieux or Zdeno Chara, dunking a basketball. Or someone tough, like Joe Thornton, a football under his arm, as he plows through defenders on the gridiron. Heck, Ed Belfour used to compete in triathlons. I’m sure one of those lame “Be A Player” sets from the mid-1990s had to have at least one hockey player engaged in some other sport…besides golf, of course. Lindros retired after last season, and works for the NHL Players’ Association. I hear he is quite nice about signing autographs through the mail. I wonder if he’d sign his baseball card. 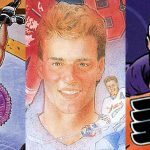 * – That is not to say that Lindros was not featured on other hockey cards in 1990. 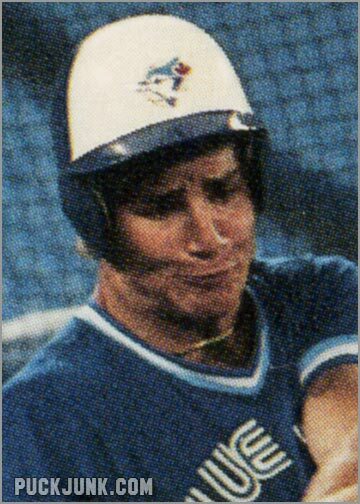 He had a card in the Oshawa Generals team-issued set, and was also “somewhat” featured on an Upper Deck card, despite Score’s exclusive contract with Lindros – but that subject is best left for another day. Thought I’d let you know I went and bought one of these on COMC after this post. Hope you didn’t pay $10 for it like people were back in 1990.